Saltburn Artists’ Projects’ next exhibition, Surface/Layer, involves work by North East- and North Yorkshire-based artists working with either glass or paint. Each artist creates their pieces by either manipulating or layering the surface of the medium in which they work. Jo Jones was born in North Yorkshire, but grew up in South Africa. These early experiences, together with her more recent travels to India, Brazil and Puerto Rico, are reflected in her colourful glasswork. 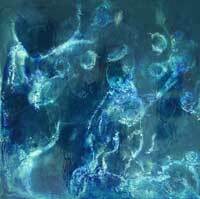 In contrast, Bren Head draws inspiration from closer to home – her paintings were made in response to archaeology uncovered after a fire on Fylingdales Moor. Eva Bauer is also a painter. 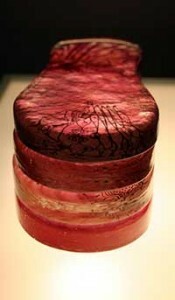 She uses large amounts of varnish, giving the surface of her pieces a glossy, polished effect. Effie Burns often works with architects and creates pieces for specific locations – she says that “each project becomes like a journey”. 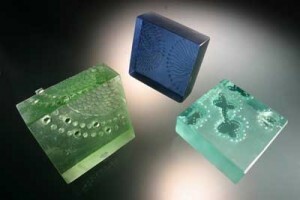 Her glasswork in Surface / Layer is reminiscent of Indian printing blocks. The preview for Surface / Layer takes place at the Saltburn Gallery on Friday 29th September, from 7-9pm. The exhibition continues until 12th November.